We like to view images we find online and see if we can figure out how the person who posted may have created the image. Of course, there are those that are exactly as they were taken. But, generally those that stand out have had some effort put to them with photoshop or other enhancement software. Now, with so many apps on the iPad to edit and enhance photos, the game has jumped up as photos on mobile share services are being made to pop more by folks that play with several apps to get what they re looking for. One feature we thought was requiring desktop software was the layering of multiple photographs. 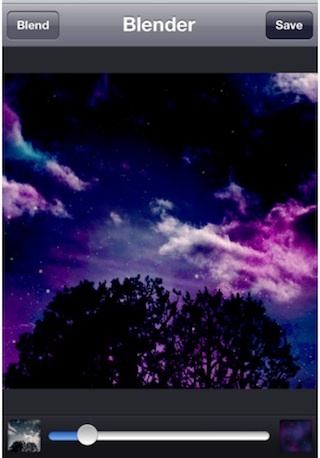 Today, we found a inexpensive solution, the universal app Image Blender. When working with images in Image Blender, it is possible to apply the included filters to enhance the images to be layered. We were playing with a few wood images today, applying filters, to actually create a layer that we can apply to other images. After you have your images the way you want, use the Image Blender slider to adjust the strength of the images against each other. Do you the sky to be stronger than the foreground image? One of the first images we tried was a night sky and a town… now we have a town with stars that we wouldn’t normally see so well together. 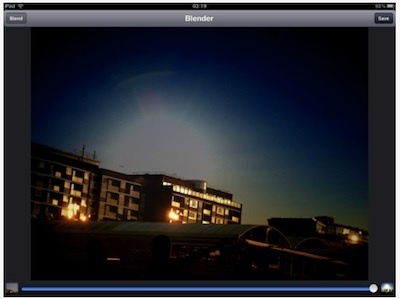 The features of Image Blender work across the multiple iOS devices you have. 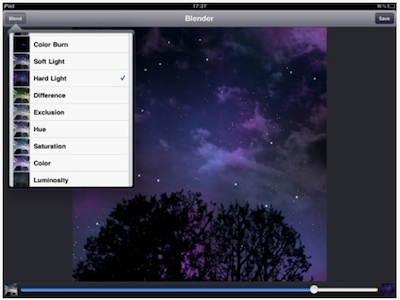 Being universal, you can install across your iPad and iPhone, where with he iPhone4s you can edit rather high resolution images.